Chemicals produced by vegetables such as kale, cabbage and broccoli could help to maintain a healthy gut and prevent colon cancer, a new study from the Francis Crick Institute shows. The research, published in Immunity, shows that mice fed on a diet rich in indole-3-carbinol – which is produced when we digest vegetables from the Brassica genus – were protected from gut inflammation and colon cancer. While the health benefits of vegetables are well-established, many of the mechanisms behind them remain unknown. This study offers the first concrete evidence of how I3C in the diet can prevent colon inflammation and cancer, by activating a protein called the aryl hydrocarbon receptor (AhR). "We studied genetically modified mice that cannot produce or activate AhR in their guts, and found that they readily developed gut inflammation which progressed to colon cancer," explains first author Dr Amina Metidji from the Francis Crick Institute. "However, when we fed them a diet enriched with I3C, they did not develop inflammation or cancer. Interestingly, when mice whose cancer was already developing were switched to the I3C-enriched diet, they ended up with significantly fewer tumours which were also more benign." By studying both mice and mouse gut organoids – 'mini guts' made from stem cells – the researchers found that AhR is vital for repairing damaged epithelial cells. Without AhR, intestinal stem cells fail to differentiate into specialised epithelial cells that absorb nutrients or generate protective mucus. Instead, they divide uncontrollably which can ultimately lead to colon cancer. "Seeing the profound effect of diet on gut inflammation and colon cancer was very striking," says senior author Dr Gitta Stockinger, Group Leader at the Francis Crick Institute. "We often think of colon cancer as a disease promoted by a Western diet rich in fat and poor in vegetable content, and our results suggest a mechanism behind this observation. Many vegetables produce chemicals that keep AhR stimulated in the gut. We found that AhR-promoting chemicals in the diet can correct defects caused by insufficient AhR stimulation. This can restore epithelial cell differentiation, offering resistance to intestinal infections and preventing colon cancer. "These findings are a cause for optimism; while we can't change the genetic factors that increase our risk of cancer, we can probably mitigate these risks by adopting an appropriate diet with plenty of vegetables." As well as correcting altered AhR dependent gene expression, dietary I3C also had a surprising effect on unmodified mice with normal AhR expression. While normal mice fed on standard or I3C-enriched food did not develop tumours during the study, those fed on a 'purified control diet' did. Laboratory mice are usually fed a standard grain-based 'chow' which contains a mix of ingredients and nutrients. For dietary studies, they are given a 'purified control diet' so that researchers know exactly what is in the food. These are designed to precisely fulfil the animal's nutritional needs while being free of allergens, pathogens or variable ingredients found in standard chow. Purified control diets contain exact mixtures of carbohydrates, proteins, fats and fibres enriched with vitamins and minerals. However, the latest study suggests that these diets have fewer AhR-promoting chemicals than the standard chow or the I3C-enriched diet. 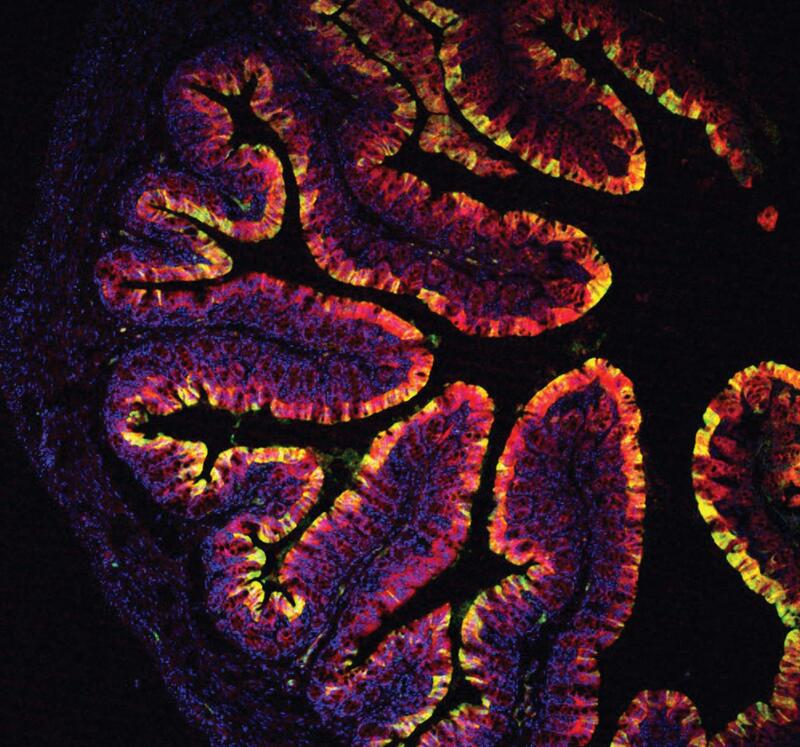 "Normal mice on the purified control diet developed colon tumours within 10 weeks, whereas mice on the standard chow didn't develop any," explains co-corresponding author Dr Chris Schiering, who worked on the study at the Crick and now works at Imperial College London. "This suggests that even without genetic risk factors, a diet devoid of vegetable matter can lead to colon cancer." To follow up on their surprising findings, the team are now hoping to do further experiments in organoids made from human gut biopsies and eventually human trials. "A number of epidemiological studies suggested that vegetables may be protective against cancer," explains Gitta. "However, there is very little literature on which vegetables are the most beneficial or why. Now that we've demonstrated the mechanistic basis for this in mice, we're going to investigate these effects in human cells and people. In the meantime, there's certainly no harm in eating more vegetables!" Professor Tim Key, Cancer Research UK's expert on diet and cancer, said: "This study in mice suggests that it's not just the fibre contained in vegetables like broccoli and cabbage that help reduce the risk of bowel cancer, but also molecules found in these vegetables too. This adds to the evidence that a healthy diet, rich in vegetables, is important. Further studies will help find out whether the molecules in these vegetables have the same effect in people, but in the meantime there are already plenty of good reasons to eat more vegetables"